Winter officially arrives next week and the cold temperatures will settle in around most of the U.S. for a while. This impacts us in many ways, including our lawn. It’s no fun having ice on the lawn, unless you want your lawn to be a skating rink. In addition to being slippery and unsightly, ice can be damaging to your yard. It’s not just the grass. Ice can also be damaging to plants. If ice crystals form in the crown of the plants, plant cells can rupture, eventually killing the plant. Sheets of ice on grass and gardens can cause problems, especially when the ice melts then re-freezes. It’s important to be aware of what can cause ice problems besides, you know, the actual ice. Lawns with poor drainage are particularly susceptible to ice buildup and damage. The combination of standing water and cold temperatures can be problematic. You can try and remove and break up some of the ice with an ice chipper. You can also wait until spring and warmer weather to assess damage and make repairs. 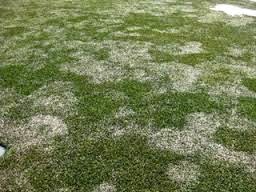 The grass may rebound by itself or it may need some help, such and re-seeding and watering bare spots to generate new grass.